X-Plane 10’s air traffic control (ATC) system is powerful and realistic when you want to practice real-world protocols, but completely unobtrusive when you want to just fly. Although AI aircraft (i.e., those that you have turned on using the Aircraft & Situations dialog box) will always follow the guidance of the air traffic control, they will also work around your aircraft if you are not interacting with the ATC. Note: You will only be able to hear the air traffic control chatter if ATC audio output is enabled; to confirm this is the case, open the Settings menu, then click Sound. All interactions with the air traffic control occur via the on-screen ATC menu. To access this menu, simply press Enter (Return) on the keyboard. Alternatively, you can use the Joystick & Equipment dialog box to program your joystick to access this menu. In order to make a request or hear from the air traffic controllers, you must have your COM 1 radio tuned to the proper frequency for the request. Filing a flight plan is independent of any controller, so that option is always available. However, once the flight plan is filed, you must tune to the Clearance Delivery, Ground, or Tower frequencies (if available, in that order as in the real world) to get clearance for takeoff. After you get clearance, you tune to the Ground (if available) or Tower frequencies for your taxi clearance. When you get to a hold short line, ground control will hand you off to tower and then you’ll receive handoffs throughout the rest of your flight when necessary; keep tuning to the proper frequency to continue to receive air traffic control guidance. Note that the Local Map dialog box (opened from the Location menu) will display the relevant frequencies for any airport that you mouse over. As in the real world, any ATC interaction begins with filing a flight plan. 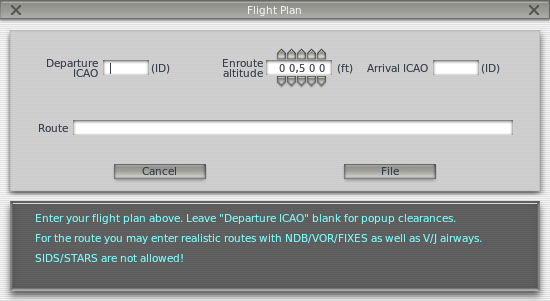 Thus, the first time you press Enter during a flight, the only option available will be “File Flight Plan.” Click that line of text to display the Flight Plan dialog box (shown in the image to the right). You must enter your departure and arrival points, in the same ID format as the points appear in the X-Plane maps, as well as your planned cruising (enroute) altitude. Pressing the File button will register your flight plan with the X-Plane air traffic control. Use the Open Aircraft dialog to load a small aircraft, such as the Cessna 172, as this will be a quick flight. Use the Select Global Airport dialog box to position yourself at a gate at KSEA. Enter KSEA as the departure ICAO, set your altitude to 3,000 feet, and then set your destination to KBFI. We’re going to leave the route blank because we want to go direct, but you could also enter any NDB/VOR/FIX/Airway to get real routings. When you’re done click File. You now have a flight plan in the system. If you wish to change your mind, you can return to the flight plan dialog in the same way and update it. You need an IFR clearance before you can proceed, so tune your COM1 radio to 128.00, the clearance delivery frequency at KSEA. Now bring up the ATC menu and you’ll see an option for “Request Clearance.” Click that and you’ll receive your clearance. Bring up the ATC menu and read back your clearance. You must read back all instructions from ATC. Note that if you hear a beep when you click on any ATC menu items, that means that another aircraft or controller is busy talking on the radio. As in the real world, you must wait for them to finish talking before you can talk. You must also respond within a reasonable amount of time or they will repeat their instructions. Once you’ve received and read back your clearance, tune the COM1 radio to 121.70, the frequency for the ground controller at KSEA. You must call ground to receive a taxi clearance. Acknowledge his clearance and then look around you. You’ll see yellow arrows painted on the ground directing you to where he wants you to go. Where the arrows stop, you must also stop and wait for further instructions. Taxi to where the arrows are taking you. When you reach the side of the runway, ground will instruct you to contact the tower. Read back the command and then tune to the tower frequency of 119.90. Go to the ATC menu and check in with this new controller. This is how you tell the controller you’re now on his frequency waiting for his command. If there are aircraft using the runway, you will have to wait until they are done. This may take some time! At that time, Tower will call you and instruct you to cross 16L/34R and to taxi to 16C/34C. Respond and then start taxiing. Upon reaching your departure runway, you will again have to wait until the runway is safe to use. Tower will then call you and give you your takeoff clearance. Respond and then depart. Unless otherwise instructed, fly the runway heading up to your cleared altitude of 3,000 feet. At some point, you will be handed off to the center controller on 124.20. Check in with him in the same manner. Continue on your heading and altitude and eventually he will begin vectoring you to an approach at your destination of KBFI. Follow his commands. Once the approach is set up, you will be handed off to KBFI’s tower for landing and the process continues until you’ve arrived back at the gate.